In October 2015, Abdul (pseudonym), the financial director of the nationwide group, the Ghanaian Small Farmers Association (GSFA), was busy preparing for GSFA’s bi-annual board meeting. In addition to arranging for transit and accommodation for a dozen farmers converging in the capital city, Accra, he was anxiously deliberating over one of the most important decisions for the event: whether or not to hire a caterer for the day-long meeting. Abdul compiled a list of potential venues and brought them to GSFA’s executive director. Two of the three restaurants were in high-end hotels—Alisa and Fiesta Royal—while the third, Afrikiko, was a well-known nighttime spot by the presidential office. All of the options were pricey, costing around 40-60 cedis ($10-15) per “pack,” referring to the Styrofoam container-packaged “take away” (to-go) meals the venues would provide. I asked Abdul why he was not considering restaurants nearby GSFA’s office, the site of the board meeting. Accra’s elite hotels are known to use imported ingredients rather than locally-sourced produce, and local caterers would likely charge half the price. Abdul explained that they had served Afrikiko at the last board meeting and were happy with the results. The matter was settled. On the day of the event, I eagerly awaited our Afrikiko lunch, wondering if the food would live up to its hype. 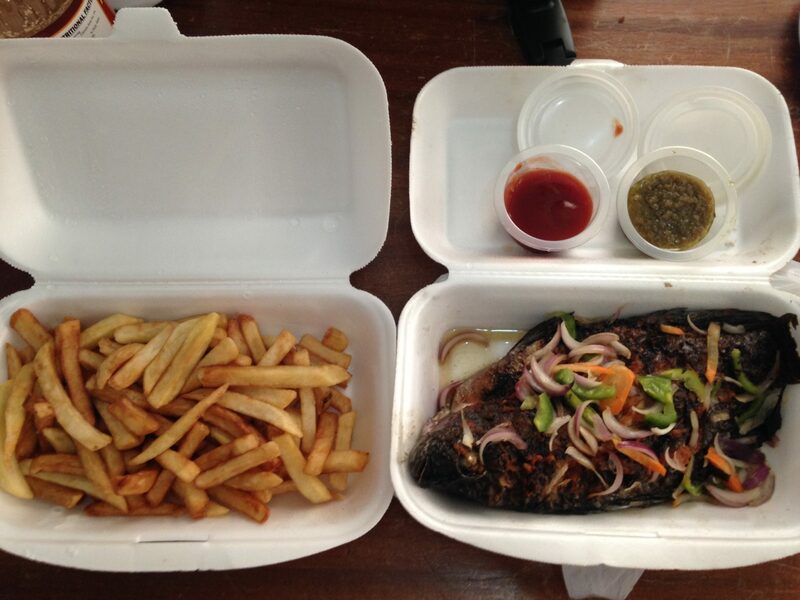 As I ate my tilapia and French fries, cold from the 25-minute drive between Afrikiko and GSFA’s office, I asked myself how and why this food was deemed more appropriate for a meeting between farmers than cheaper, hot meals from a neighborhood caterer? That lunch turned out to be the first of many meals that left me asking questions. Since 2014, as part of my research on biotechnology and agricultural development in Ghana, I have attended dozens of development programs throughout the country. These programs—events, workshops, trainings—are impressive microcosms of so-called development efforts. They are where farmers, government officials, development practitioners, NGO program officers, and the occasional anthropologist share spaces, ideas, and meals. Culinary moments were not banal details but, rather, a vehicle for event organizers to request recognition from their participants and lay claims to legitimacy within development worlds. Food is a crucial and an expected aspect of these meetings, often served in the form of a snack, and later, a full meal. For organizers like Abdul, there is pressure to perform in terms of the fare served while working within the confines of a budget. Meals are either eaten on-site or packaged for later consumption, providing not only nourishment but often, just as importantly, a much-needed break from all-day meetings and a time to chat informally. During the catering encounters—such as at the GSFA board meeting or a conference of horticulturalists and gardeners that served no vegetables—I realized that the culinary moments were not banal details but, rather, a vehicle for event organizers to request recognition from their participants and lay claims to legitimacy within development worlds. I began to question the role that the social dimensions and cultural capital of food might play in catering decisions. Drawing on Pierre Bourdieu, I began to map the multiple aspects of what might make meals desirable in the specific context of a development workshop. Cost, of course, is an important component. Organizers, whether catering to a board meeting of twenty people or an event hosting hundreds, must work within a budget, which at times limits options. However, in some cases, such as the one above with Abdul, padded budgets allow for catering from more high-end sources and/or purchase of special food items, such as accompanying tilapia with French fries rather than the standard banku, fermented corn mixed with fresh pepper and fish. Tied to cost is the understanding that meals served at meetings in Accra, like the GSFA meeting, ought to be special, something that participants from the outside might not be able to access elsewhere, such as Afrikiko. Powerful development actors… use food to communicate with their supposed constituents. Thus, catered food acts as a vehicle for organizers to communicate with attendees, thanking them for taking the time to be at the event, or, in some cases, establishing the organizer’s legitimacy with the audience. For instance, in late 2015, GSFA held a forum on smallholder farming in collaboration with the social development organization, Progress Ghana. The forum’s funder provided a generous budget, allowing the event organizers to invite hundreds of farmers, development practitioners, and government officials, including the country’s Minister of Food and Agriculture. Wanting to impress upon these high-ranking guests, and having the budget to do so, Progress Ghana held the forum at one of Accra’s luxury beach-side hotels, a venue whose grandeur juxtaposed with the topic at hand: peasant farming. The venue and food served—calamari and tea sandwiches—were meant to speak to the Minister directly, GSFA officials told me, proving to him that GSFA and Progress Ghana should be taken seriously in policy deliberations. Powerful development actors—government institutions and foreign donors, such as the US Agency for International Development (USAID)—also use food to communicate with their supposed constituents. For instance, in 2016 I attended a workshop for a few dozen Ghanaian Members of Parliament (MP) hosted by a consortium of well-funded and well-placed biotechnology organizations, all of whom receive core funding from US agencies and the Bill and Melinda Gates Foundation. The goal of the event was to “sensitize” MPs to biotechnology, with the hopes that they would return to parliament and pass a controversial plant-breeders’ intellectual property bill that was opposed by GSFA and other activist groups. Thus, the meeting was high stakes and its organizers needed to influence the MPs. After a morning of presentations, we were ushered to a poolside buffet lunch. As I walked down the buffet line I marveled at the plethora of “local” dishes before me: fufu, pounded cassava and plantain served with soup; banku; and aprapransa, palm nut soup mixed with cornmeal and garnished with full crabs. Aprapransa isn’t your everyday dish; it is luxurious, served at important life events. To this day, I’ve only seen aprapransa twice in real life; the other time was at the lavish and pricey Azmera Restaurant in Accra. Even more surprising was the inclusion of more common, everyday Ghanaian dishes—fufu and banku—that were often absent at the meetings I attended. Designations of “local” and “foreign” foods are of course socially and historically mediated, and many items today considered “local”—cassava and maize—have origins in the trans-Atlantic slave trade (Logan 2012). Such designations play out at catered lunches, where participants might refer to century-old dishes such as fufu as “local,” but deem jasmine rice, which over the past few decades has begun to transition from a luxury item to a more accessible starch, as foreign compared to African varieties of rice. Jasmine rice was also served at the biotech buffet, but the inclusion of aprapransa, banku, and fufu at an event like this is what I want to consider within its larger context. For years, Ghanaian biotechnology proponents have argued that genetically modified foods complement, rather than threaten, local foodways, and that GM foods can be used to spur a “homegrown” green revolution. Thus, serving “local” dishes appeared to be a way for the organizers to show that they valued local foods, and by extension, local plant breeders, and their role in ensuring Ghanaian food security. In this way, symbolically, the served foods stand counter to fears that circulate in public media that the bill would allow for multinational agribusiness giants to dominate the Ghanaian market and thus displace state scientists and breeders. These vignettes demonstrate how food’s cultural and symbolic capital factors into important lunch catering decisions. Depending on the political stakes of an agricultural development meeting, a cold but expensive lunch from Afrikiko might be chosen over a hot but “ordinary” meal from a local eatery, or everyday and special “local” dishes might be served alongside prestigious jasmine rice. A catered lunch is thus not merely a marker of social distinction, but is also designed to impress, influence, and assuage. From fufu to french fries in catered lunches, the meals that circulate in Ghana’s development spaces are vital to how actors seek to change the future of the country’s agricultural path. The specific foods used in the struggles to define Ghana’s agricultural future are constantly changing. On a recent visit to GSFA, I shared an early outline of this article with a colleague, Kwesi (pseudonym). He honed in on my jasmine rice example and declared that my data was outdated. Now, he said, rice is so common in the home that people don’t want to eat it at meetings – it no longer holds that special status. Instead, people desire dishes once considered too “local” and common – in a pejorative sense – but which have enjoyed a resurgence in popularity, like banku. In any case, from fufu to french fries in catered lunches, the meals that circulate in Ghana’s development spaces are vital to how actors seek to change the future of the country’s agricultural path. Joeva Rock is postdoctoral research fellow in the Department of Nutrition and Food Studies at New York University.